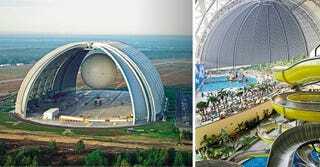 On the left: a $110 million airship hangar, the world's largest freestanding building, located 40 miles south of Berlin. On the right: that same building seen today: home to Tropical Islands Resort, a massive water park and indoor rainforest. Huh? The massive hangar, measuring 1,181 feet long by 688 feet wide by 351 high, was built by Carl von Gablenz, a German entrepreneur who thought that helium airships were the future of heavy machine transport. His company, CargoLifter AG, used the hangar to house a prototype airship capable of carrying 60 tons, but by 2002 they were bankrupt and ordered to sell the building to a Tanjong, a Malaysian company. Tanjong was not in the airship business.